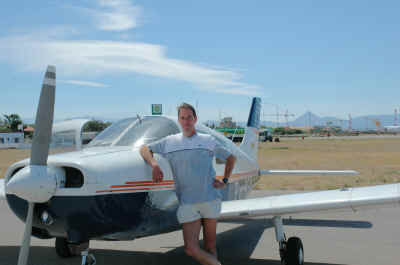 In June 2004 I joined a clubflight to the Greek Islands. In March of 2004 I heard of the plans of a trip to the Greek Islands and was interested in joining. Many years ago, when I was on holidays in Greece I always said that flying to several Greek Islands would be a very great thing to do. Now this was a good opportunity to make this dream come trough. After asking some preliminary info, my wife and I decided to join in and get more information. We joined in on a meeting where preliminary thoughts about this flight were exchanged. In the second meeting we received more details about the planning, the route and we received chart material and could start with the flight preparation ourselves. The flight would be done with total 7 small aircraft from which 6 were single engine aircraft and one twin. 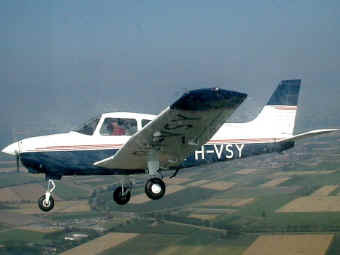 The aircraft I could use was from our flying club the PH-VSY. 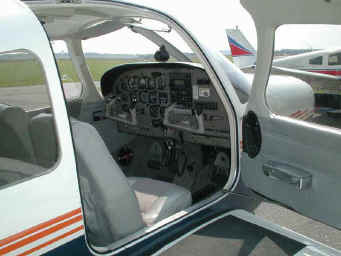 This is a piper warrior PA28 with 160 HP engine and equipped with VFR and IFR equipment, GPS and autopilot. We were flying as a group but not in formation, each aircraft had to prepare flight and fly the whole trip for themselves. Only when needed we could ask others for suggestions during the flight. The flight started on 20 June 2004 when all the flight crews met each other at the Met office. We than faced our first problem because weather forecast for our planned route was not good. We studied an alternate route via France but later we decided that the alternate was not good either because of expected strong winds in South France caused by Fohn. So then we decided to continue with our original plan and prepared for take off to our first point being the Airfield Hassfurt in Germany. 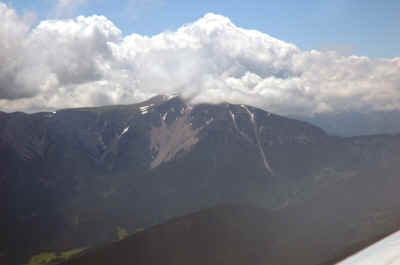 When we arrived it became clear that the planned second leg for that day from Hassfurt to Gratz in Austria was not possible due to bad weather in the Alps. We searched for a hotel in Hassfurt and found a very pleasant stay in Hotel "Goger". The next morning weather forecast for the Alps was good and we started for the second leg and took off to Gratz. 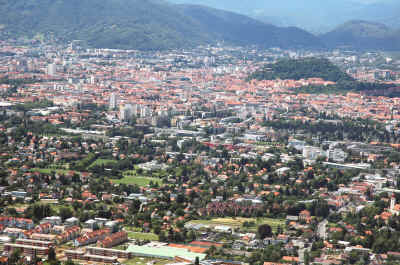 The flight to Gratz was very great, trying to find a route through the Alps with nice views enroute. The twin engine plane got some temperature problems during this flight and it became uncertain if we could continue the flight this day to the next waypoint. It was decided that the group of 6 planes would continue their flight from Gratz to the next waypoint. 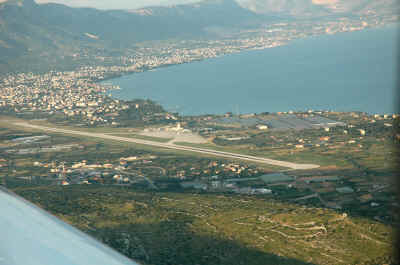 and we took off to Croatia the airfield of Split. After 3 hours flying we landed at Split and arrived at the hotel when the football match from Croatia had just started. The flying group came together and we had a very fine meal and some beers to drink. The next day we continued our route from Split to Corfu. After taking off in Split we set course to Italy, because flying over former Yugoslavia was still unsafe. 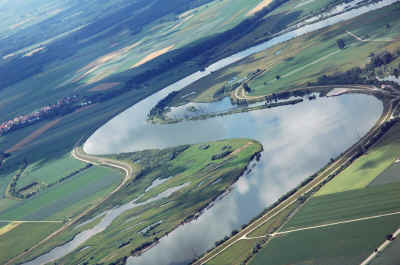 We had to fly for more than one hour over water and we had to wear swimming vests just in case of engine problems. 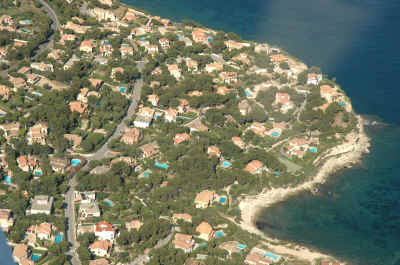 When reaching the coast of Italy we continued the flight to the south part of Italy crossing the airfields of Bari and Brindisi. 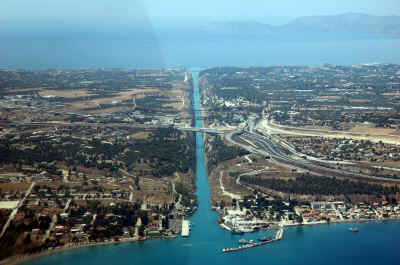 At the south-east point of Italy we set course to the island Corfu where we arrived after 3 hours and 40 minutes flying from the airfield of Split. 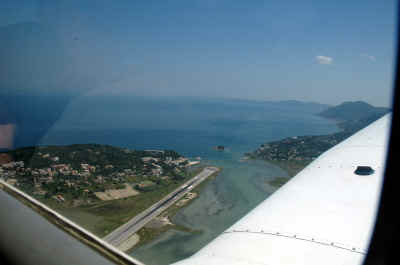 The plane which we had to leave behind in Gratz was checked and joined up in Corfu making a flight from Gratz to Corfu. That evening we were all together and joined a nice Greek meal. The next day we went to the Corfu Air Traffic Control tower to ask information about our whishes to continue the flight into the Greek islands. This was more difficult than expected because our planned next airfield of Mykonos was a big problem. Mykonos was not able to receive our group of 7 airplanes. The other problem in Greece is that only 5 airfields are available for refueling being Corfu, Thessaloniki, Mykonos, Heraklion and Athens. We decided to discuss with the group what we should do and divided the group in one part going to refuel the 7 aircraft and two others in trying to find possibilities to continue our flight. The refueling at Corfu took very long time. We had to stay with our planes and wait for each plane to get fuel. The total time needed for refueling took about 45 minutes for each plane and we lost quite some time waiting for this. Much time was lost for paper work and checking for validity of credit cards which were checked after each plane was tanked. At the end of the afternoon we again went to a hotel at Corfu and many of the group decided to go for a motor ride over the island. After getting 14 motors from a motor rent we started our ride in the direction of the North part of the island. We went to the hills of Corfu and had a very pleasant ride. Unfortunately one member of group had an accident with his motor and fell down on the asphalt. He had many wounds on arms and legs and face and was brought to a first aid post by a helpful Greek. 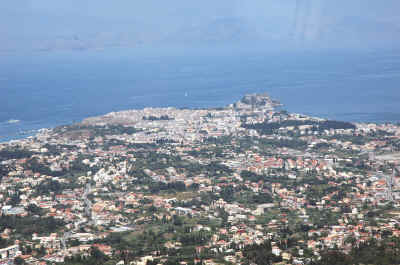 Some time later he was moved to the hospital in Corfu for further help and examination. We were very lucky that he was not severely wounded and could rejoin the group a few hours later while we were enjoying our evening meal and the winning of the Dutch football team. 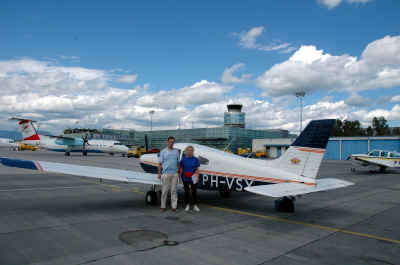 The next morning we went to the Corfu Airfield and took of for the flight to Crete Heraklion. This flight was a bit different than expected because VFR flights in Greece most follow the IFR routes. We had to file flight plans following IFR routes and stay below these IFR routes. The next problem was that we were not allowed to stay at Heraklion airport but were allowed to land and refuel and then continue to Sitia Airfield in the East part of Crete. This was because there was not enough place on Heraklion to park our 7 planes. The flight to Heraklion was a great experience because hills were on our route. When coming closer to these hills I saw clouds and decided to try to climb over the clouds to fly VFR on top. We climbed to Flight Level 120 and were free of clouds most of the time. We came two times into the clouds, first time for about 20 seconds but second time took much longer up to 1.5 minutes. We felt turbulence from the clouds and had to do our best to stay at our flight level. When this cloud was passed we became into the clear because we passed the hills and clouds were almost instantly gone. 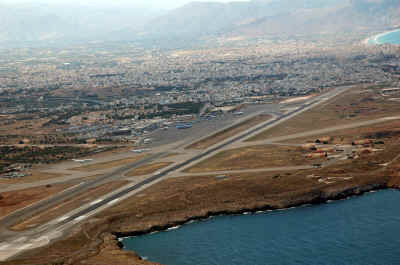 We continued the flight to Crete and when we approached for Heraklion airfield we heard one of hour group became landing clearance for landing on runway 27 but with wind of 300 degrees and 11 knots. Looking at the landing charts of Heraklion I saw that also a runway 30 was available and requested runway 30 for landing. ATC cleared me for appoach and landing on runway 30 which gave me an easy and smooth landing. Later I heard from the other crews that they had hard work for their landing on runway 27. When we met the other crews I noticed some strange things, the first planes were still in Heraklion and had not left already to Sitia. 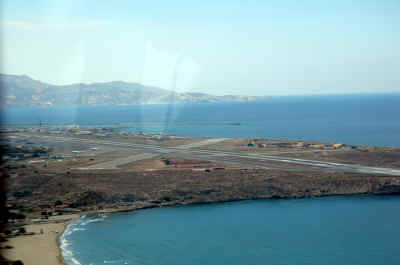 We found that the wind at Sitia was outside crosswind limits for our aircraft and that we could not land on Sitia. Due to end of daylight we could also not return to Corfu and after some conversation with authorities it was decided that we could stay at Heraklion Airfield. After finding and our arrival at the hotel we went for a Taverne and found a very nice stay and meal. The next day the group decided to split into one group going to drive by car and several others going to drive by motor. We rented one mini bus and a car and several motors. I was a driver on the minibus and we went to Agios Nicolaos a very nice town about 1 hour drive from Heraklion. Then we took the boat to Spinalonga and visited the island where people suffering from Lepra were isolated. We stayed on the island for one hour and then went back to the harbour of Agios Nicolaos. In the harbour we had a small meal, a nice Greek salad and something to drink. Then we continued the drive to the Lassithi heights which is famous for the many small windmills. After a nice drive up to the hills we arrived at the Lassithi height and went searching for the mills. At first we did not find many but after some more driving we found the part which is famous with many many mills. In a local small village we saw a shop where we bought fruit, peaches, cherries, and other. We continued the drive back to hour hotel were we arrived just after sunset, we rejoined to the group of motor drivers and had a nice meal on a Taverna at the coast. The next morning we went to the airport for the flight from Heraklion to Araxos. In the control tower of Heraklion we discussed our possible routes with an air traffic controller and we again asked to go to Mykonos. This still was not possible and we asked for the alternative Santorini. This was also not possible but we then found a route we could fly. 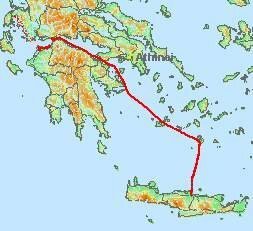 This route was planned from Crete to Santorini, then to Milos and from Milos following the Athinai VFR route to Korinthie and then via the coast to Araxos. 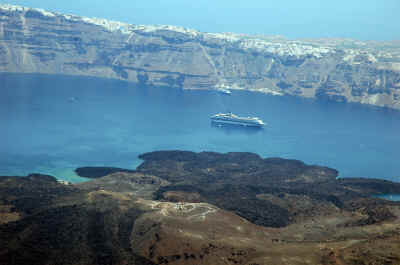 We filed flight plans for this and after packing and checking we took off from runway 30 with a heading to Santorini. When we approached Santorini we called Santorini approach and we were allowed to fly to the island Santorini and stay 2 NM west abeam the airfield. We had a nice view on the crater of Santorini and the houses on top of the crater wall. 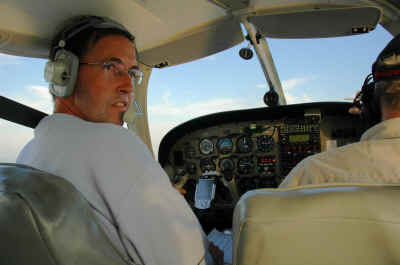 After this we set course to Milos flying at 6500 feet. When we passed Milos we had to decent because we came close to Athinai airport. We were flying at 1500 ft and temperature became high. Outside temperature was 32 degrees Celsius. 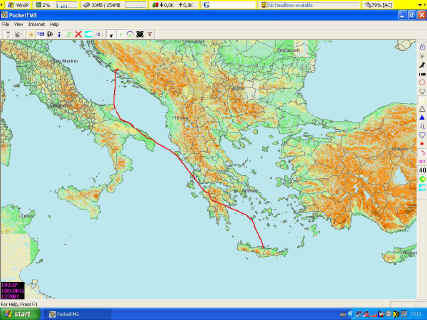 We were following the route from Milos to Idhra point Ydra then to Poros then to Dapori and the to Korinthie. We came to the famous Korinthie channel where we enjoyed a wunderful view. 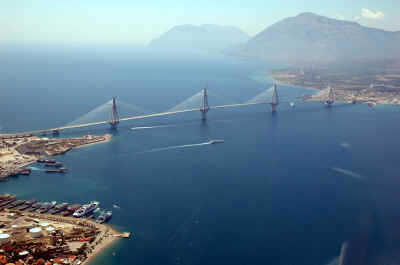 We followed the route via the coastline to Patrai where we saw the new bridge between the Greek mainland and the Pelopenessos. 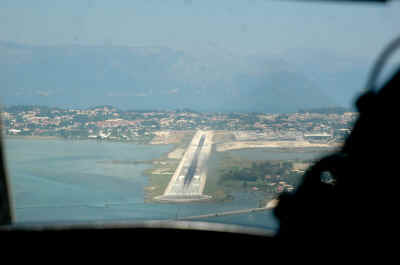 Then we were cleared to approach Araxos airfield and make a landing on runway 01R. From Heraklion to Santorini, then to Milos, then to Ydra then to Poros, then to Dapori, then to Korithie channel then following the coast to Patrai and then to Araxos airfield. The next morning we hired some cars and made a trip to the old Olympia where we visited museum and the remains of Olympia. Later that day we had a short swim in the sea and the whole group came together for a drink and the evening meal. On the next morning our trip home would start and we went to the airport for the first leg home. This trip was planned from Araxos to Sienna. 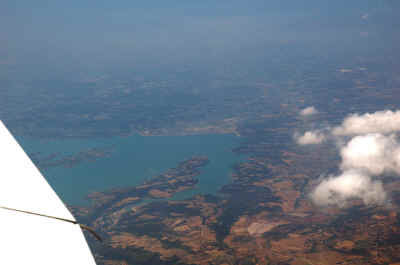 We took off from Araxos and we were going to Corfu for a fuelstop. 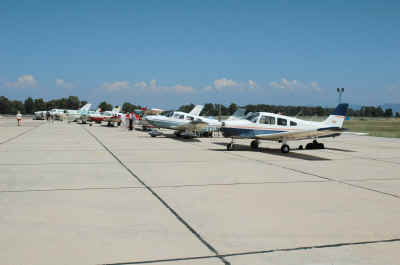 Only 3 aircraft of our group went to Corfu and the rest went direct to Brindisi for a fuelstop. As we arrived in Corfu it was very busy and we were afraid that it would cost a lot off time. Somehow this works just the other way around in Greece because we got our fuel very fast and after a bit more than one hour we could depart to Brindisi. 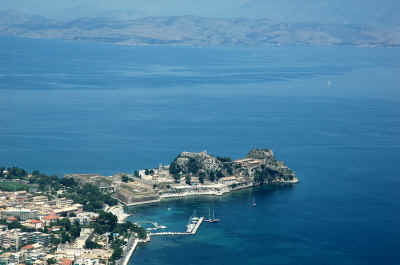 After take off we could again enjoy the wunderful view of Corfu town and we set course to Italy. After almost 1½ hour flying we arrived at Brindisi where we had something to drink and to eat. Also we took a refuel for our next leg from Brindisi to Sienna. We followed the route along the east coat of Italy until we reached San Benedetto del Tronto where we set course to Sienna overflying Perrugia airfield. This leg took 4 hours flying time and we arrived at 19.55 local time. This day was a very hard one with a bit more then 7 hours flying and starting with very high temperature at Araxos. We went to a Hotel and enjoyed the meal and a good night sleep. The next morning our flight continued from Sienna to St Ethienne in France. 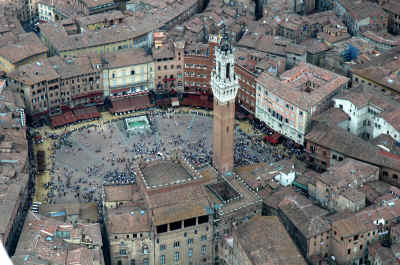 We took off from Sienna and made a small tour over the city off Sienna because at this time the famous horse races were taking place and wanted to take a look. 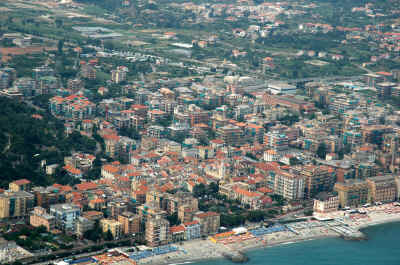 Then we set course to the west coast of Italy and followed the coast line to the north. We came across Pisa and then to the hills for Marmer. We could not fly very close to these hills because these where restricted for flying. We followed the route coming along Genova, Savona, Albenga San Remo, Monaco, Nice, then via Cannes to the airport from Cannes "Mandelieu" for a fuelstop. This flight took 3 hours 25 minutes. After refueling and something to eat and drink and off course filing a flight plan we took off for the second leg off this day to St Ethienne. Due to poor visibility and some clouds inland we decided to change our planned route and follow the coastline to Marseille and then continue following the Rhône to the North. 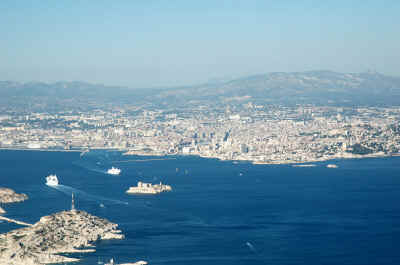 We had a wonderful view on Marseille just before we set course to north. After 3 hours and 25 minutes flying we landed at the airport of St Ethienne. We had a wonderful approach for St Ethienne because we already saw the runway when we where 25 NM away. We where allowed for a straight in approach and could enjoy this a lot. At St Ethienne the group enjoyed the last evening together because next day we would be at home. We stayed in a very new hotel very close to the airfield about 10 minutes walk. The next morning we prepared the flight back to the Netherlands. After departure from St Ethienne we set course to North and followed the route to our next airfield "Troyes" were we stayed for a fuelstop and something to drink. The last part of our route was from Troyes to Rotterdam crossing Belgium end following the route to Terneuzen then to Hoek v Holland for the "Hotel" arrival at Rotterdam. The group at Rotterdam had a few drinks together and some of them rejoined with their wifes before we all went home. In total we had a bit more than 39 hours flying time in 11 days. Total distance was around 6200 km with landing on 13 airfields in 9 different countries. We enjoyed this trip very much being a great experience for privat pilots and having the fun for flying to a famous country as Greece. Making your first landing on an airfield in Greece is a great feeling. Flying in Greece is not difficult but always be sure that you can refuel at your destination or you don't need fuel until you can reach an airfield with fuel. Air traffic control in Greece is helpful but sometimes not able to handle 7 aircraft in a short time period. Mixing IFR and VFR traffic is sometimes difficult for ATC in the Mediterranean part of Europe but we did not have any big problems during our flight. Waiting is sometimes the biggest problem but this also happens to people who fly with airliners. I had a wonderful time during this flight and am looking and hope for many more new trips in the near future.